This updated 7th edition coffee table collection is a Disney lover's dream come true! It is a guided tour through the many legendary years of Disney music. The book begins with an extensive musical history of Disney, followed by beautiful piano/vocal arrangements of 70 Disney classics. Printed on deluxe stock with more than 100 stunning full-color illustrations accompanying the text and music, this book is a keepsake to treasure for years to come! 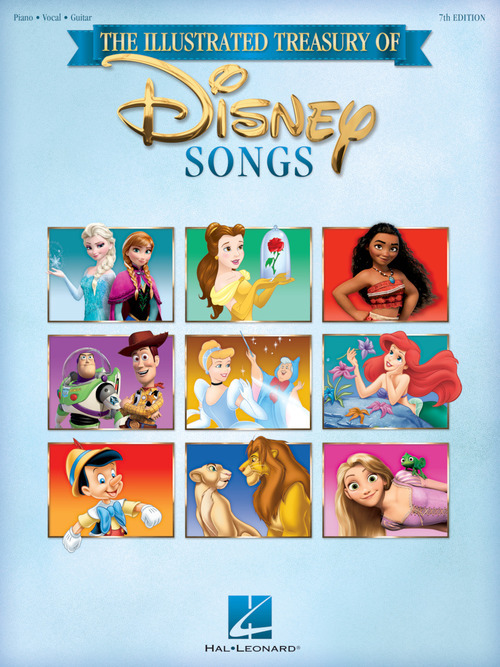 Songs include: Bibbidi-Bobbidi-Boo (from Cinderella) • Circle of Life (from The Lion King) • Evermore (from Beauty and the Beast) • How Far I'll Go (from Moana) • I See the Light (from Tangled) • Let It Go (from Frozen) • Under the Sea (from The Little Mermaid) • When You Wish Upon a Star (from Pinocchio) • You've Got a Friend in Me (from Toy Story) • and more.